I’m not a fan of Nutrition Essentials Probiotic. I couldn’t give it any higher than a 1 out of 5 star rating for a variety of reasons. There isn’t much that I like about this probiotic. Actually, the only thing I like is that you don’t have to refrigerate the tablets. But that’s about it. The tablets themselves were hard for me to get down. Preference may be at fault here because I don’t like swallowing huge tablets, but these are definitely on the larger side. The directions say to take one or two tablets daily on an empty stomach. I like supplements better when you only need one a day (I’ve got enough things to remember on a daily basis). After taking the tablets, I felt sick every single time! I thought it was a fluke, and I gave the product the benefit of the doubt since probiotics can sometimes cause temporary belly pain. These tablets are also NOT safe for kids. The cost of a bottle is an expensive $50, which is just ridiculous to me. I’m not sure where you’re getting your money’s worth on this one? Lastly, there is a lack of information on the bottle and on the website. It doesn’t clearly state if there is potential allergy concerns, which is a red flag to me. I like when companies state their ingredients and allergens loud and proud so we can steer clear of possible problems. So, needless to say, I don’t like this probiotic and I don’t recommend it. Overall, it made me sick, it was expensive, it’s not safe for kids, and I didn’t see any positive results. You’re most likely better off spending that $50 on a higher quality product that can offer much better results! Nutrition Essentials Probiotic has 15 billion cells in a unique one-strain formula. This strain has been shown to potentially help with digestive disorders such as Irritable Bowel Syndrome (IBS), Inflammatory Bowel Disease (IBD), ulcerative colitis, and Crohn’s disease. Bacillus Coagulans may also be able to help lessen the severity of traveler’s diarrhea, respiratory infections, and side effects of taking antibiotics. Another potential benefit that this strain might have is helping improve immune function and fighting off bad bacteria. The lack of information on the bottle and on the website is an issue. I don’t see any allergy concerns labeled clearly anywhere. However, I get nervous when the company doesn’t make this actively known. If you do have bad allergies, I suggest steering clear of this one; we don’t want you to get sick! For 60 tablets (a one month supply), it will cost you a pricey $49.99. This ends up being $1.66 per day to take these supplements. This is by no means a good deal and actually is incredibly expensive. I can’t wrap my head around why it costs so much. For far less money, you can get a much higher quality probiotic that won’t break the bank. One of the main reasons for the one star rating was the negative side effects. The first time I took these tablets, I got a bad stomachache. Stomachaches are fairly common with probiotics (especially if you’re trying a new brand) so I gave this supplement the benefit of the doubt. Unfortunately, the stomachaches carried through the entire time I took these supplements. Usually after the 3rd or 4th day, side effects will diminish (at least that’s what I’ve noticed personally). With Nutrition Essentials Probiotic, I felt gross the whole time. I didn’t see any positive effects, only pain, so I definitely won’t be trying this supplement again. 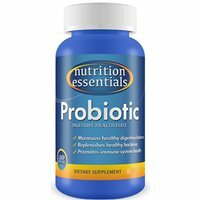 Nutrition Essentials Probiotic does have a 100% money back guarantee if you buy through Amazon.com. It looks like Amazon is the one and only retailer for this product. The guarantee is a perk, but in my opinion it’s not worth the stomach pain, even knowing I can get my money back. But at least it’s there for those of you who want to take a leap of faith on this one! To buy Nutrition Essentials Probiotic, click here.